The future seems bright for the automobile. A whole host of technologies -- including self-driving systems – is set to reinvent the auto industry, making cars more computerized than ever. But not everyone shares a rosy outlook. His fear is that consumers who buy next-generation cars will face obstacles to modifying or repairing them -- like purchasing a smartphone, only far more expensive, with manufacturers in sole control over the tech upgrades. In other words, the car of the future might operate as a closed system. But Perens and data privacy lawyer Lothar Determann are proposing that the auto industry consider taking a page from the tech world, and make vehicles more like PCs. “The car has become a computer on wheels. Why isn’t it more like a PC?” said Determann, a partner at law firm Baker McKenzie, Palo Alto, who also teaches technology law at the University of California Berkley and in Germany. The two have written a soon-to-be published paper, intending to spark discussion over this idea about “open cars,” or next-generation vehicles that will be open to tech upgrades, third-party products and security researchers. Drivers can already upgrade their rides with better tires, more powerful stereo systems, and an assortment of aftermarket parts. But tweaking the computers in cars has run up against intellectual property laws, which concerns Perens. He can easily envision a future where automakers have control over the core tech, and sensitive data, contained in cars -- a prospect he believes will have big downsides for consumers. He’s particularly worried over how these next-generation vehicles will age over time. Maybe they'll contain features like internet-connected systems or self-driving capabilities. But who will update them and make sure they remain safe? The obvious answer is the car manufacturer, which doesn’t thrill Perens. Imagine consumers facing pricey upgrades to keep their vehicles up-to-date. Or cars hobbled by software vulnerabilities because vendors are slow to roll out patches. Old tech gadgets may be cheap to replace, but not cars. “The car manufacturers have to be conscious that maybe these cars will be in use in 20 years,” Determann said. Bruce Perens (left) and Lothar Determann (right). A buggy or no-longer-supported vehicle is something no one wants. So the paper written by Perens and Determann examines the idea of open cars, which could offer consumers more choice and lower prices. For instance, consumers dissatisfied with one self-driving system could swap it out for a competing product. That’s because the hardware from one car manufacturer would integrate with another. 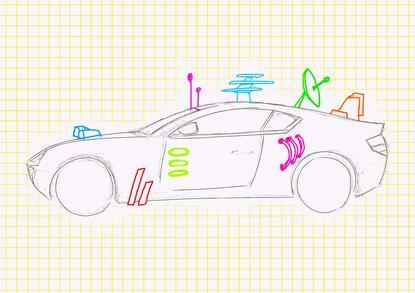 Add-ons like new sensors and software could be bought from not just one vendor, but many, and then installed in the car. Third-party security researchers would have access to the systems, giving them a chance to inspect a car’s source code for any vulnerabilities or digital privacy issues. However, the open car idea also means a paradigm shift for the auto industry -- a shift that car makers probably won’t like. Eric Dennis, an analyst at the Center for Automotive Research, said big auto manufacturers want more control over their cash cow, not less. Governments might also stand in the way. Other than vast amounts of cash, safety regulations and rigorous car testing prevent anyone from simply waltzing into the car market. “Automobiles are inherently different from other consumer-related electronics,” said Sven Beiker, an auto industry expert who lectures at Stanford University. Change in the market can be slow because existing cars makers often stress safety, he said. “They’ll say ‘safety, safety, safety,’ but it’s also for the safety of their business margins,” Beiker said. Whether consumers really want that much choice is another matter. Although desktop PCs can be upgradeable, many users choose MacBooks, which offer fewer upgrade options -- not least because of Apple's restrictive warranties. The same might be said for future cars. Trustworthy brands tend to command more loyalty, even when product choice and upgrades are limited. 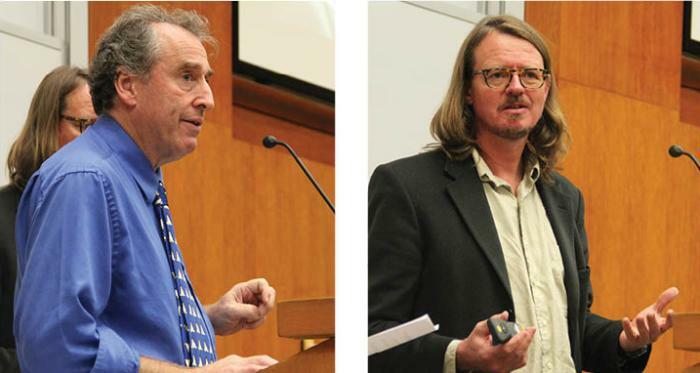 Both Perens and Determann are well aware that their open car idea faces obstacles. Their own paper acknowledges the pros and cons, and that open car systems will stumble if shoddy third-party vendors become involved. Nevertheless, they think it’s time the industry considers the implications of building highly computerized cars, before going full throttle. “There’s going to be pressure to keep the software up-to-date, and not to use hardware beyond an expiration date,” Perens said. He himself has gone through at least six mobile phones over the course of owning his 2007 Toyota Prius, and wonders how future cars will keep up with rapid technological changes. “We haven’t seen much discussion about it, so we thought this might kick things off,” Determann said. Their open car idea may sound like a threat to the auto industry. But every car vendor has a vision for their future business, Determann said. And for some, it may include a degree of openness. He can imagine partnerships between automakers and software vendors to support the tech features in next-generation cars. In that way, “we might see more open and closed cars competing on the road,” he said. Perens, on the other hand, said lesser-known companies, like some Asian manufacturers, might be able to pump open cars into the market, bringing down costs. How the future will actually play out is anyone’s guess, but he’s hoping it favors consumers. “My ideal is for the consumers to be in the driver seat, and not the manufacturer driving the choices,” he said.